Shidoshi Jeffery Russell trained in the Bujinkan since his early teens. He trained in Japan for over four years after receiving his shodan (black belt) in the United States. Shidoshi Russell began his training in Bujinkan under Shidoshi Jeff Duncan of the Roanoke Valley Bujinkan www.rkebudo.com, before departing for Japan. He earned his Godan (5th degree black belt) from Soke (Grandmaster) Masaki Hatsumi in 2001. Shidoshi Russell passed on his teaching to Sensei Bryan Garner in 2005 who continues to run the school, honoring the same traditions. We dedicate our training and teaching to Jefferey Russell who passed into the light in December of 2008. He is greatly missed but we continue to carry his warrior spirit with us. 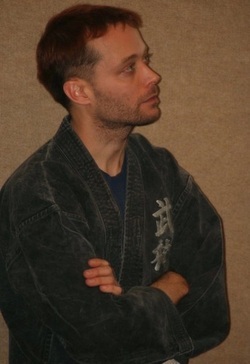 The main instructor at Kashiwa Bujinkan Ninjutsu. He currently holds a Godan rank (5th degree blackbelt) in the Bujinkan system. He has been involved in martial arts since he was five years old, receiving two shodan ranks in other martial arts. He has trained in traditional Karate and Kenpo systems as well as Aikido and Kendo. 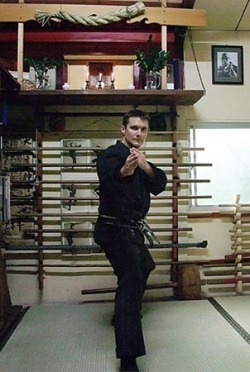 Sensei Garner became the sole pupil of Shidoshi Russell and has been honored to continue on in the Bujinkan System. He took over the instruction of the Air Force Academy's Ninjutsu Club in 2004. He also taught martial arts at high school for over two years before opening his own dojo. He has attended many seminars throughout the United States and has recently traveled to Japan to further his training. With over ten years of intensive study, experience, and dedication, he hopes to further his abilities and maintain a school to honor the legacy of the Ninja.